XS Nightclub Las Vegas NV is the #1 Vegas nightclub in 2016 that opened its doors over 7 years ago on December 31st, 2008 on New Year’s Eve. This 5 star award winning 40,000 square foot venue consists of 13,000 square feet of club space on the inside, and a 27,000 square foot pool area on the outside. There are 7 bars total, 217 VIP tables with 105 tables on the inside, and 113 tables on the outside pool area that also include 27 cabanas on upper and lower levels. The total capacity of this venue holds 5,000, and was also voted #1 on The Nightclub & Bar Top 100 list in 2010, 2011, 2013, 2014, and 2015. This venue employs over 100 staff workers to operate its facility on the busiest nights of the year. XS Nightclub Las Vegas NV is the Ultimate Vegas Nightclub of its own kind that was designed after the most productive features of Tryst Nightclub, and was inspired by the curvaceous female body. The 1,100 square foot dance floor is located in the very center of the club that’s enclosed by 18 dance floor VIP tables in 360 degrees. . The inside of the club has luxurious brown, black, brass, and gold colors with gold accents, decorations, and furnishings. There are 3 gold plated molds of naked women that are 15 feet tall behind the bar, a gold staircase, gold bar tops, gold chandlers, pillars, lamps, and even gold crocodile leather on the furniture. XS Nightclub Las Vegas NV is a Vegas nightclub that focuses largely on table reservations that require table minimums. The inside club has 6 table type selections that include Small Tables, Back Wall, 3rd Tier, 3rd Tier Big Couch, 2nd Tier, and Dance floor sections. The outdoor pool area also has 6 table type selections that include Standard, Good, Upper Cabanas, Lower Cabanas, Pool side, and Prime sections. The closer your table is to the DJ booth, the higher the price of the table minimums. When is XS Nightclub Las Vegas NV open? This Vegas nightclub is open on Friday, Saturday, Sunday, and Monday from 10:30pm to 4AM. Where is XS Nightclub Las Vegas NV located? This Vegas nightclub located in the middle of Wynn and Encore Hotel and Casino mall, net to the Wynn Theater. It’s about a 3 minute walk to get to the venue from the Casino Entrance or the Main Valet entrance at Encore. How much is cover charge at XS Nightclub Las Vegas NV? This Vegas nightclub has a cover charge that costs about $20 to $40 for ladies and about $30 to $60 for gentlemen. You can expect to pay more during holidays and during special events. The cover charge cost really depends on the DJ that is performing. You can purchase presale tickets, as well as line passes, or you can try tipping a host to get you in quicker. Purchasing XS bottle service from our company will automatically cover your admission and additional people in your group depending on the table type you book. How long do I have to wait in line at XS Nightclub Las Vegas NV? The line at this Vegas nightclub takes anywhere from 1 to 3 hours on the busiest nights, and during slower nights the line wait takes around 25 to 45 minutes. On Friday and Saturday nights it’s highly advised to show up at the doors by 10PM, especially on top tier DJ headliner nights. You can arrive a little later on Sunday and Monday around 10:30 to 11 if there isn’t any top tier DJS scheduled to perform. During Sunday Night Swim you should arrive at 10PM especially if there is a big DJ scheduled. Once the venue reaches its capacity limit, the security guards are ordered to not let anyone back in inside club if they go outside unless they have the proper stamp on their arm. What type of music does XS Nightclub Las Vegas NV play? This Vegas nightclub plays Electronic Dance Music which consists of Trance, House, Dub Step, Electro, and Break Beats. Who are the Resident DJS as XS Nightclub Las Vegas NV? This Vegas nightclub holds resident DJ positions for some of the best DJS in the world. DJs such as David Guetta, Zedd, Deadmau5, David Kaskade, Avicci, Skrillex, Diplo, Sebastian Ingrosso, AN21, and The Manufactured Superstars to name a few, have all performed. Famous celebrities are also known to frequent the club with past visits from Usher, Jermaine Dupri, Lil John, Katy Perry, Nick Jonas, Mario Lopez, Kat Von D, and Paris Hilton. What is the dress code at XS Nightclub Las Vegas NV? This Vegas nightclub has a strict dress code policy that they are not afraid to enforce. Don’t expect to get in if you are sagging or are wearing any sportswear, baggy clothing, ripped jeans, tank tops, or hats. You should pay attention to the type of shoes you are wearing too. We suggest you should avoid wearing tennis shoes. Dress shoes are highly advised, along with collared shirts that are tucked. How much money does XS Nightclub Las Vegas NV make? This Vegas nightclub is 100 million dollar venue and has been called the #1 club in America! Since the operation began, their revenues on average have increased a little over $10 million a year on annual basis, and generated as much as $105 million in 2015, and are estimated to generate as much as $115 million in 2016.
Who designed, developed, and manages XS Nightclub Las Vegas NV? 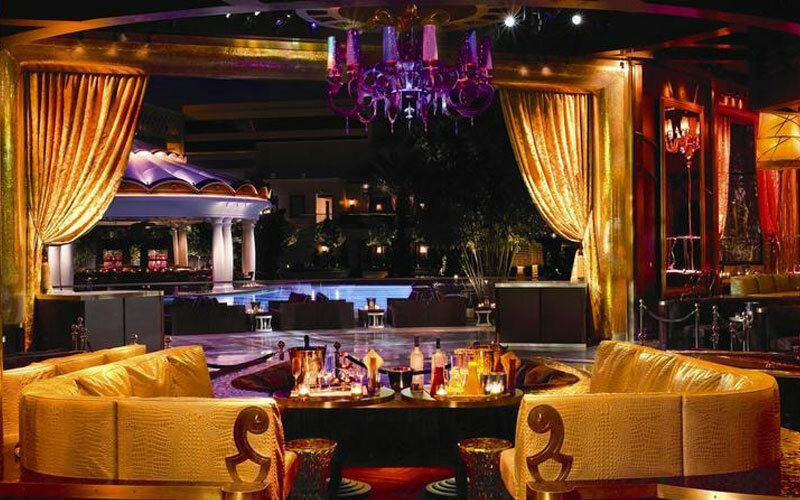 This Vegas nightclub that was designed by Vice President Roger Thomas of the Wynn Design Group and developed along with Victor Drai who was bought out in 2010 to pursue Drai’s Beach Club and Nightclub. 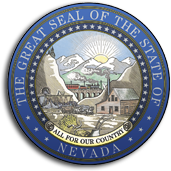 Original management was led by Cy Watts who departed in August 2010, and his brother Jesse Watts who later departed in August 2015 for an executive position at Alon Las Vegas which is scheduled to open in 2018. In March 2016 the management partner position was filled by Alex Cordova immediately after his departure from Hakkasan Group. What is Sunday Nightswim at XS Nightclub Las Vegas NV? 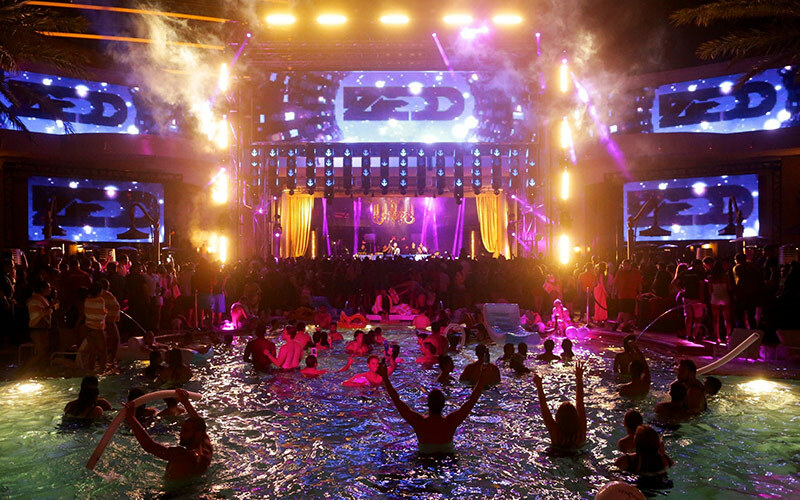 This Vegas nightclub during the Spring and Summer time feature a pool party called “Sunday Nightswim.” This special event features top tier DJ performances where the club and the Encore Pool seamlessly combine together creating an evening that is just as popular if not more popular than the events held on Friday and Saturday. You can expect the club to reach its capacity during Sunday Nightswim, and it’s known to generate the most revenue for the club. The line wait can take 2 to 3 hours depending when you arrive. You can expect the table minimums to be at their highest especially on a Sunday during a holiday. When was XS Nightclub Las Vegas NV renovated? 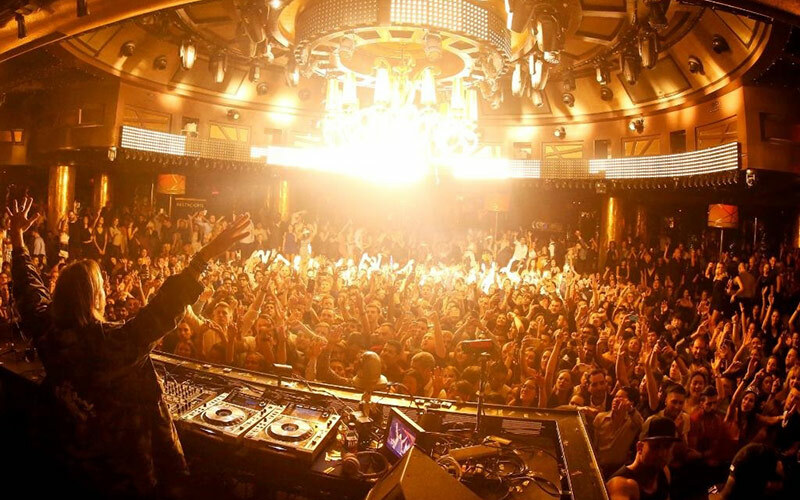 In January of 2013 the club would undergo a 2 year renovation that was completed on January 5th 2015 to focus on upgrading everything from a technical stand point that would include $10 million dollars of lighting, sound, video upgrades and additions that would also increase energy savings tremendously at XS Nightclub Las Vegas NV. What type of Lighting design does XS Nightclub Las Vegas NV have? This Vegas nightclub hired Steve Liberman of SJ Lighting to be the mastermind behind the lighting re-designs that would multiply the equipment involved by 4 times the amount from the original installment. Oracle LED Systems went into partnerships with SJ Lighting and supplied their video LED, and redesigned the new installation panels. Elation Lighting was brought into the lighting fixtures, and strobe fixtures. Steve Liberman would install a hybrid lighting fixture that would operate like a beam light, but offer a profile fixture that would install a frost system to generate wash effects for XS Nightclub Las Vegas NV. 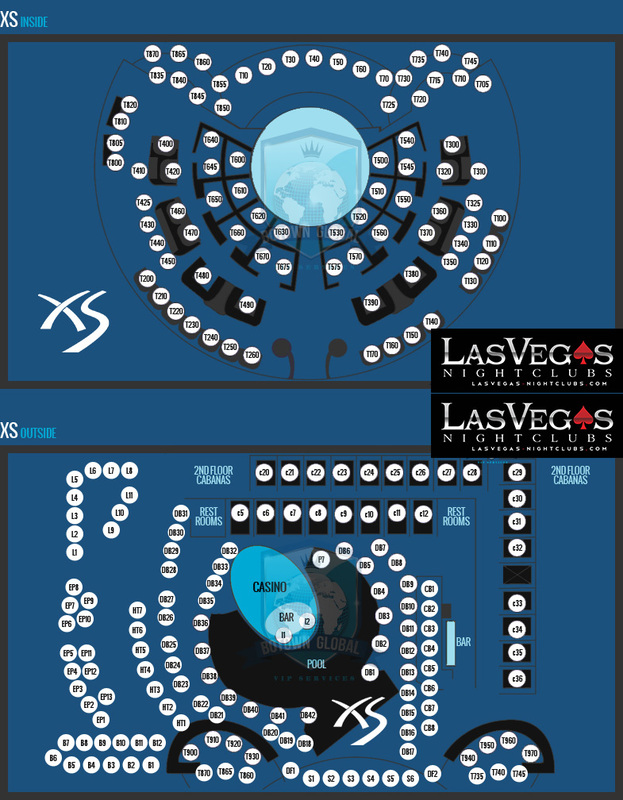 What type of DJ Booth does XS Nightclub Las Vegas NV have? This Vegas nightclub has an enlarged DJ booth that is the central focal point from the back of the club to the center of the dance floor where you will find 10 foot gold plated revolving chandelier with choreographed lighting hovering above. The DJ booth is the midpoint that divides the indoor club to the outdoor pool area, and has a VIP section with 6 tables that wrap around from behind. The enlarged DJ booth has 14,000 LED lights, and a double kabuki drop in front that creates a strong introduction for the performing DJ. What type of Video design does XS Nightclub Las Vegas NV have? This Vegas nightclub venue had the goal of providing the best visuals with their redesign. Framing the DJ booth in the outdoor pool area is a 16 x 12 video screen above the dj booth with 2 additional 2 sets of high resolution moveable LED 3D video screens on each side creating broad visuals for spectators. The moveable LED video screens are capable of shifting positions in different directions to give each DJ their own custom appearance. The LED video screen customized truss structure used 17 Elation Lumina Strips for the lining for smooth wash and blinder effects. The indoor and outdoor walls display high resolution video supplied by Oracle LED Systems who implemented as many as 240 Oracle TR foot panels and installation frames. 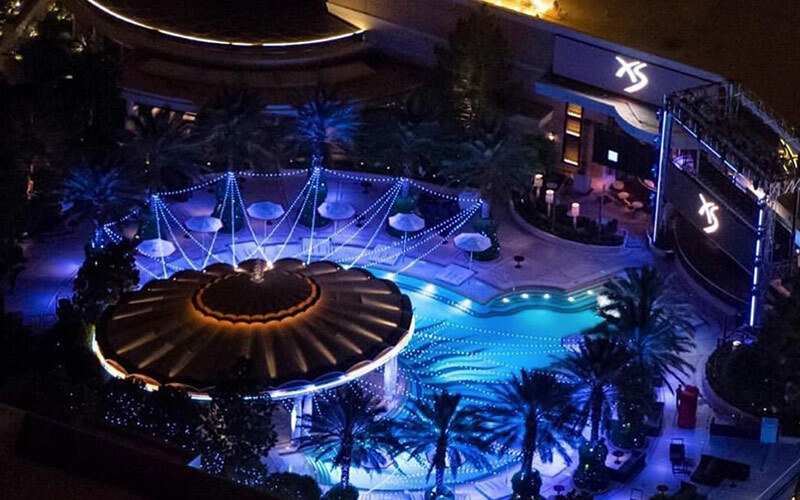 What type Lighting design does the outdoor pool at XS Nightclub Las Vegas NV have? This Vegas nightclub has an outdoor pool area that added seamless lighting and theatrical effects during the redesign, along with pixel mapping over the pool. Elation Platinum SBX lighting was also installed in the pool area, along with 14 Elation Platinum Spot 15R Pro white moving heads were used as spots and washes for texture and coverage. The palm trees display lasers and stringed LED lights that connect to the bar, and wrap around the cabanas. The roof above the pool deck has installed a massing flame throwing pyrotechnic system that adds the incredible visuals.